SKB’s new Roto Shock Racks feature a 20" deep rack frame installed in a roto molded tough shell with an integrally molded valance that eliminates the metal valance on the outside of the case, coupled with a rubber gasket on both the front and rear doors for water resistant protection. 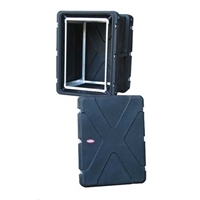 The integrated molded valance, ergonomic handles, and recessed, heavy-duty twist latches allow these cases to meet most ATA and military specifications. As well as roto molded toughness and ATA ratings, new elastomeric shock technology has replaced the metal coil system to provide an increased level of protection to valuable equipment. Field-replacing our standard shocks with other available elastomeric shocks can easily accommodate multiple weight bearing requirements. This new Shock series has the recognizable Roto X pattern and they are stackable within the series. Outside Dimensions: 29-1/2" x 29-1/2"